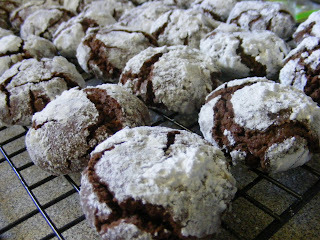 This is one of our all-time favourite biscuits around here, and it is quite often made at all times of the year (although not recently) I copied it out of a Christmas issue of Family Circle magazine about 8 years ago (sorry, don't have the original to tell you exactly how old it is). ~ cream butter and sugar. we love these! just the right hint of spice and chocolate. lovely to eat warm from the oven with a cup of coffee. I've even given these in a glass jar as a gift, and they were very well received!